IP Result of anti-RAD51 (IP:14961-1-AP, 3ug; Detection:14961-1-AP 1:1000) with mouse testis tissue lysate 4000ug. 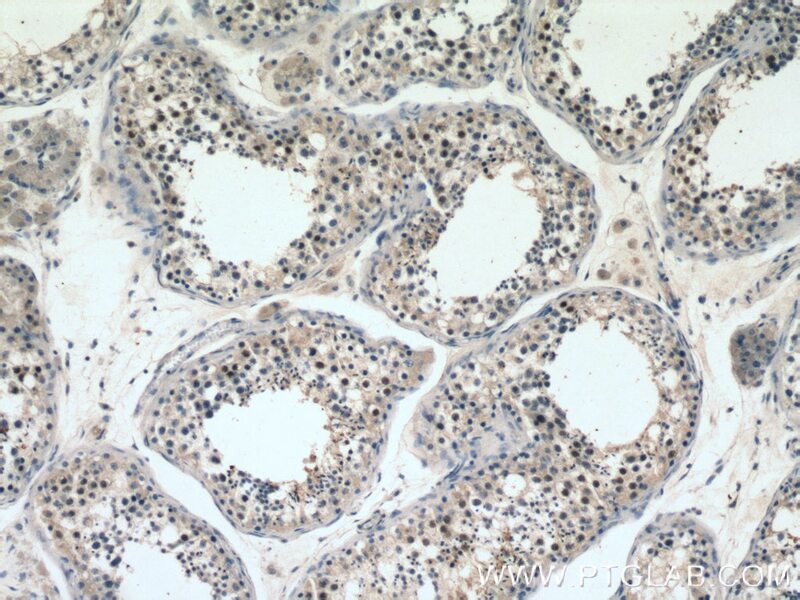 Immunohistochemical analysis of paraffin-embedded human testis tissue slide using 14961-1-AP( RAD51 Antibody) at dilution of 1:200 (under 40x lens). 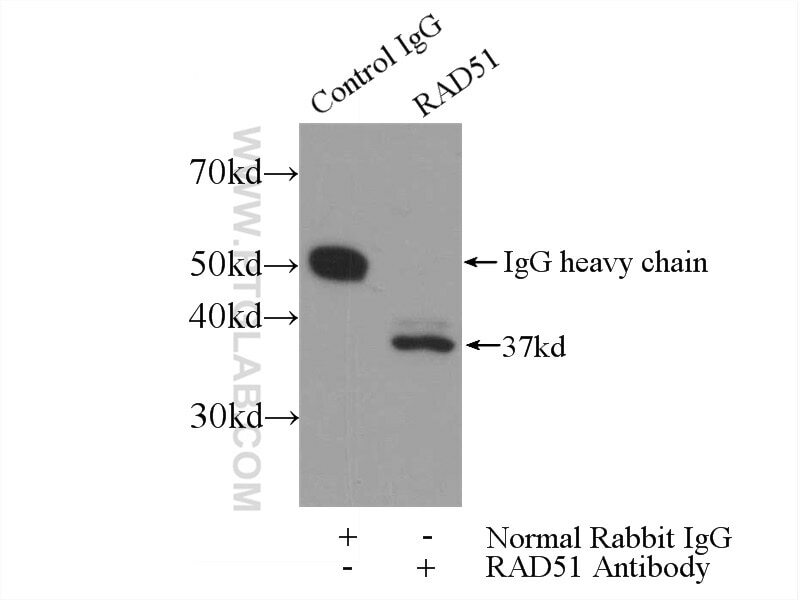 RAD51 plays a critical role in the maintenance of genomic integrity by functioning in the repair of DNA double-strand breaks. It mediates homologous pairing and strand exchange in recombinatory structures known as RAD51foci in the nucleus. It also can bind to single and double stranded DNA and exhibits DNA-dependent ATPase activity. In addition, it has a role in regulating mitochondrial DNA copy number under conditions of oxidative stress in the presence of RAD51C and XRCC3. Triptolide interferes with XRCC1/PARP1-mediated DNA repair and confers sensitization of triple-negative breast cancer cells to cisplatin. Radiosensitisation of bladder cancer cells by panobinostat is modulated by Ku80 expression. 5-Azacytidine Enhances the Radiosensitivity of CNE2 and SUNE1 Cells In Vitro and In Vivo Possibly by Altering DNA Methylation. Unpredicted Downregulation of RAD51 Suggests Genome Instability Induced by Tetrachlorobenzoquinone. 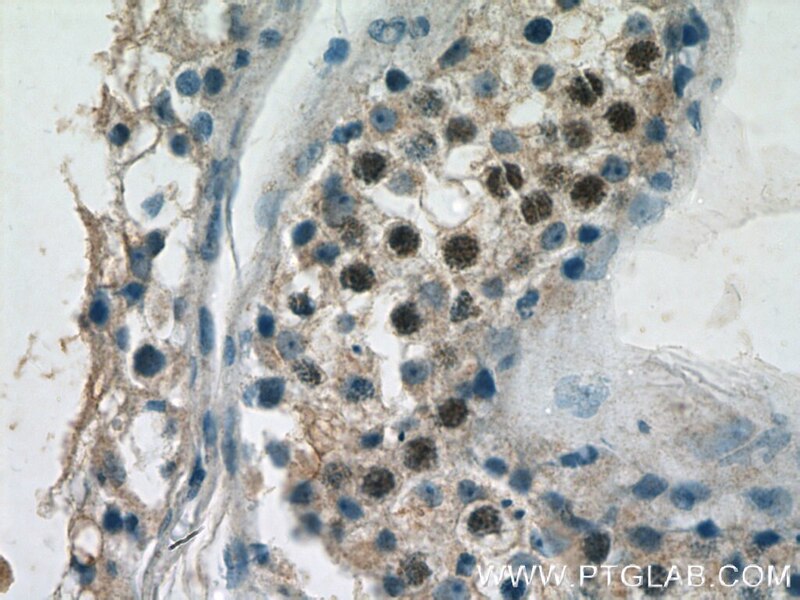 Immunohistochemical analysis of paraffin-embedded human testis tissue slide using 14961-1-AP( RAD51 Antibody) at dilution of 1:200 (under 10x lens).